Young Ludwig Wittgenstein: If people did not sometimes do silly things, nothing intelligent would ever get done. 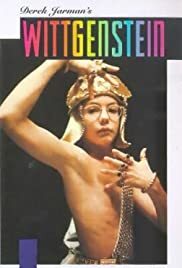 Although there is no accounting for the audacious and experimental style in which artist and filmmaker Derek Jarman has put together this offbeat biography of the famed philosopher Ludwig Wittgenstein, one can't help feeling a little disappointed by the slight and unimaginative focus the film gives to the real life concerns of this great and forward thinking individual. As the previous reviewer points out, if you (much like myself) know little to nothing about the philosophical or biographical background of Wittgenstein the man, then this film really offers very little in the way of enlightenment; never giving the audience the chance to gain real insight into the character or the events of his life, save perhaps, for a few brief scenes included to prove a point. This lack of information and development is a serious problem that mars the film greatly and is a problem that can only be attributed to Jarman and the writers. Much like his similarly themed, off-kilter biography of the artist Caravaggio (1986), Jarman here ignores the facts and instead opts for more of a personal deconstruction. As much admiration as I have for the director to break away from the usually rigid confines of biographical pictures that seem to force feed the audience an entire life in a neat and digestible two-hour course, I do not admire his way of frequently shifting focus from any real artistic or intellectual talent, onto what seem like very trivial, melodramatic examinations of sexuality. Interspersed between serious scenes of Wittgenstein trying in vain to explain his theories to the masses, or amazing sequences where reality is broken down and all sorts of bizarre images are allowed to overflow from the screen, there are irrelevant and silly sequences where Wittgenstein and his lover cuddle in a cinema or have insignificant arguments that recall a homosexual take on a Hollywood rom-com. What we get from the film is simply Wittgenstein as a contemptuous, arrogant, petty loner who wasn't against berating the children who couldn't decipher his highly intelligent philosophies and wasn't happy unless he was dispelling all around him. Now, this may only be a half-truth, but since we never learn the full fact of the matter this cloddish rendition is the only conclusion we can make, which, for a real and important historical figure is far below standard. There is however a saving grace here, and, as ever with Jarman, it is in the visual presentation of the film. Never overly flamboyant, and never getting in the way of the story, the design of the film still bold, innovative and highly impressive. Faced with a miniscule budget, the limitations of British television and a shooting schedule of just over fifteen days, most filmmakers would have produced a film with no visual imagination whatsoever. Jarman however took that challenge and created one of the most surprising visual experiences ever filmed; and all within the confines of a London warehouse. Of course, many will balk at the idea of using a little imagination when watching the film -- having been weaned on a combination of high-concept and MTV, I myself found it a struggle to look past the minimalism of the set design or the disconcerting contrast between picture and sound -- but if you look a little deeper, the effect of Jarman's theatrical framework gives way to a wealth of hidden details. This is a film in which the visuals capture the imagination, even if the story doesn't; creating an amazingly sensory feel similar to what Lars von Trier did with the film Dogville (2003). By the time the film is over you'll swear you saw scenes and images that never actually appeared, images that were formed purely in your imagination. Wittgenstein (1993) demonstrates a talent for creating an outrageous atmosphere in a restrained setting and the ability to instill a feeling of longevity to the visual design that manages to outlive both the narrative and the character. Still, it could have been so much more - Jarman's self-serving and idiosyncratic storytelling approach means we can only imagine what could have been. If Jarman had restrained his need for self-assessment and put as much imagination into the script as he did with the iconography we could have been looking at a near-masterpiece. What we have instead is simply a bizarre, confused, interesting, though inconsistent experiment that leaves the viewer with some seriously mixed feelings.